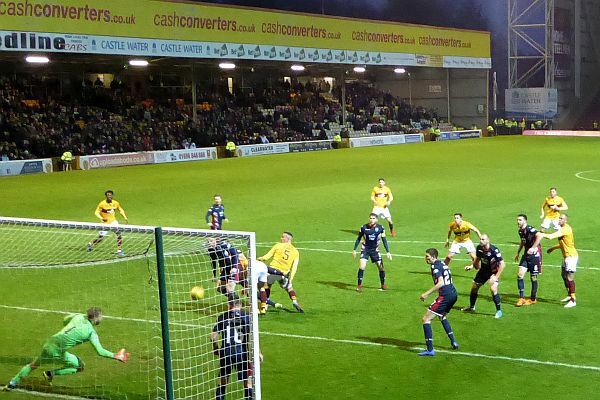 Congratulations to Ross County for their deserved victory at Fir Park. They were the better team from start to finish. A late consolation from Jake Hastie was not enough to counter Brian Graham’s second half double as the visitors ran out 2-1 winners. After a scrappy first half the warning signs were there for all to see. County looked sharper and more comfortable in possession while we struggled to implement whatever tactics had been planned. Graham could have had a second half hat-trick while we hardly tested their ‘keeper. There was some optimism when the team lines revealed that both Gboly Ariyibi and Ross McCormack would make their first appearances since joining in the transfer window. But it did not take long for the strangely muted home support to sense that all was not well. We shaped up in 4-4-2 formation but were reduced to launching it long with occasional thrusts on the left wing as Frear tried to make progress. The visiting defence was able to soak up our blunt attacks before they broke with some fine passing play to Gillespie’s goal. The new boys hardly had a touch in the uninspired first 45 minutes and it was not a surprise to see Main start the second half as he replaced McCormack. Gillespie had to be at his best to deny Lindsay then Main might have converted Frear’s cross had his touch been better. The game was lost with Graham’s goals in 52 and 60 minutes. Both followed deliveries from McManus as the striker headed then shot us out of the competition. The expected substitutions followed and we produced a frantic, if unpromising, attempt to salvage the game. Fox rose well to punch the ball off Main’s head and in added time Jake Hastie headed from close range to complete the scoring. It was a poor, poor performance from a Motherwell side that showed no benefit from the training week in Tenerife. The visitors were up to game speed while we seemed still to be at half pace and clueless. A massive improvement will be needed when Hibs pay a visit on Wednesday.